After a short trip home, I’m back in campus! I took the ETS from KL Sentral to Parit Buntar. The ride back was a smooth and comfortable journey! Turns out only coach C sells food. Plus I did not have any stranger sitting next to me during my return trip and had ample leg room. I slept a lot too. WC picked me up from the Parit Buntar station, then we went to Home Cafe for lunch. It made me quite happy when WC suggested we had lunch at Home Cafe. Cafes are usually not WC’s cup of tea. 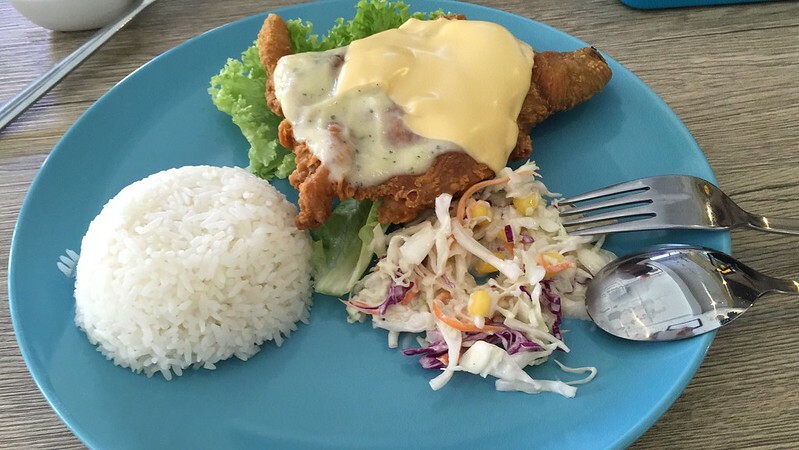 I had the Cheese Chicken Chop with Rice and WC had the Lemon Chicken Chop. We also ordered a Charcoal Grilled Ice Blended Coffee but it was nothing to shout about. I got back to my room and started my mini spring cleaning. Cleared some cobwebs and wiped my shelf and table. The room feels much cleaner now. Then I lazed a little before my shower, and had nugget rice for dinner with WC. The other day WC’s mom gave me some red dates as well. Dad asked me to boil some for WC to drink. During lunch I asked if he knew what red dates were, but he thought that they were goji berries. Haha. But he did mention that he doesn’t like dates, not specifically red dates though. I did pack a few red dates back to campus. I think I’ll try boiling it tomorrow, and possibly bribe WC into trying it.